What site would be complete without a page on the cute trio. Baby Godzilla is the little hatchling Godzilla. He was found on Baz island next to an egg that had already hatched. The scientists take the egg back for study. 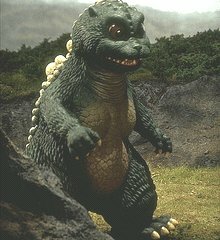 The egg hatches into Baby Godzilla, who believes that a scientist named Azuza is it's mother. Baby Godzilla eventually goes with Godzilla back to Baz island and they live peacefully together. Little Godzilla is about half the heighth of Godzilla. He lives with Godzilla on Baz island. He tries to fight SpaceGodzilla, but is nearly killed in the proccess. Godzilla Junior is the final form of Baby Godzilla. Mutated by the explosion on Baz island, he is now an adult. He is lured to Tokyo by Miki Segusa, in hopes that Godzilla will follow and be killed by Destroyer. Godzilla Junior wins, but is killed when Destroyer is mutated into it's final form. But Godzilla Junior absorbs Godzilla's access radiation after Godzilla dies and becomes the next Godzilla.